It’s not exactly news that social media is big news for marketing. In fact, it seems to be all that some magazines and blogs talk about! But for all the buzz, is it worth the time and effort and opportunity cost? You see, social media marketing LOOKS free. But for anyone who’s had a crack at it, you’ll know it’s extremely TIME intensive. It’s also a slow build – especially if your business is not in a “hot” space, like fashion or music. I’ve yet to see a case where social media was a huge marketing lead generation tool for business – but that doesn’t mean it isn’t happening. What I have seen work well is community building and “engagement” in the social media space. It’s also hit the point where if you’re NOT in the social media space, you look like you’re ‘old school’. So with that in mind, are there tools out there to help you? Luckily, yes – and they’re a lot cheaper to access than they were a year or two ago. I’ve used Lujure.com and Woobox.com. All are multi-purpose and have quite low subscription levels – from free to around $30 a month on average. I’ve used Lujure to build a landing page inside a Facebook page – so that instead of landing on the generic wall, you can link to a particular tab that’s specific to the promotion you’re running. And I’ve used Woobox to run a promotion inside Facebook. Both have been relatively easy to use and are worth trying out. (You will need to invest in some graphic design for images though – otherwise your promotions will look too homemade). You can claim a USERNAME for a page (sometimes called a vanity URL). So instead of the “messy” URL that Facebook will auto-generate for you, you can have something like: Facebook.com/WiggyBusiness. If you post images, you’re more likely to be “liked” or shared. So avoid text based “updates” only. Why do you want people to click “like”? Because it improves your chance of being seen by the person and their friends. The more you post, the more likely you are to continue to collect fans. Once a week is not enough. Several times a day is better. As is posting outside business hours, as this is when most people check Facebook. Timeline gives you much great visual impact – and soon you’ll HAVE to use it. So put some thought into your large image and profile pic. WHAT A WEBSITE LOOKS LIKE IS NOT AS IMPORTANT AS HOW IT WORKS. The build – the mechanics that drive it and affect how easy (or impossible) it is to update, how well it can be indexed by Google, etc. The sales – does it get your prospects / customers / members to do what you want them to do. Do they buy, or comment, or sign up. If your site won’t – or can’t – deliver you a result, who CARES how pretty it is. This is not to say there’s no role for design. But if the world’s most successful ecommerce sites are Amazon and eBay, you should have got the hint that looks aren’t worth much! I’ve been in online marketing since 2000. 12 years. I’ve worked with ALL sorts of sites, in all sorts of business. What I’ve seen is that websites built on CUSTOM systems are never a good idea in the long run, unless you’re prepared to spend a lot of money. By custom systems, I mean that every web company (and their dog) have built a CMS (content management system) over time. Or they’ve had a graphic designer “design” a pretty site and then coded it to suit. If you are on a limited budget do NOT go this route (and even if you have a good budget, you may find that using a back end system almost no-one else uses will limit you within 2-3 years). Use a cloud based computing solution like WordPress or an open source system like Joomla or Drupal. If you want an ecommerce store, use MagentoGo or Shopify or Big Commerce. Don’t start from scratch unless you’ve got millions of dollars (or hours) to waste OR your website actually DOES something unique that needs unique systems and programing. Most don’t. Most are online brochures or online stores. It is not cutting corners to use these systems. It’s SMART. It’s a good use of your funds. It’s still a “proper” website. You wont be locked into one developer. Millions of people are using these, so you’re not paying for the upgrades. It’s not a short cut. It’s not doing it poorly. Build your success on the learning of millions of businesses before you. That’s what a smart zero budget marketer does when they can. If you’re a small business selling products online, you can’t underestimate the importance of product photography. Even if you have a low or zero marketing budget, there really is no excuse! You can get a cheap camera for a hundred or so dollars and do a better job than most online stores do. You could even use an iphone and use one of the hundred or so photography apps out there that can improve even the worst photos. Depending on your product, photography can also often be sourced from the suppliers, so there’s little excuse to not provide…well, MORE. You see, the secret isn’t really GREAT photography (although that helps). It’s having A LOT OF PHOTOGRAPHY. When people can’t touch and feel, try to give them the next best thing. Pictures, pictures and more pictures. 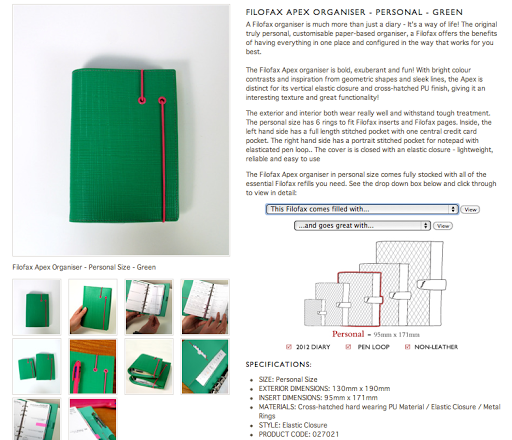 I’ve included this listing from fab Melbourne online stationery store Notemaker. This is a fantastic example of how to use product photography well. Why? -It gives you lots of angles & perspectives. -It shows you inside and out. -It shows it to you in someone’s hand (valuable for PERSPECTIVE, which can be hard to judge online, even if measurements are provided). – The COLOUR in the shots is consistent between shots. Consistent, and natural lighting if possible, is the way to get this. Now what can be really worthwhile is including video (Asos does this with many of their clothing items). But that’s a bigger ask than photography, so I won’t get off topic. So, consider what you’re selling online. We talk a lot about words, and design, but consider if there are enough pictures to really SELL it. If not, head off an get cracking! What makes an effective Facebook advertisement? Have you ever been engaged – and then visited Facebook? After changing my FB status last year to engaged, the advertising I was served was ALL related to weddings. Or losing weight. Or wedding dresses. Or wedding accessories. Had I been seriously in need of suppliers, it would have been pretty helpful actually…which I did notice when wearing my “marketing” hat. (That said, I really enjoyed being able to change the status to married as I looked at a lot of those ads way too many times. Hint: don’t run the same ad for months at a time!). I’ve yet to have the occasion to run a Facebook advertising campaign for a client, but I’m watching and waiting for the right chance. Why? They currently seem to be an inexpensive – and less cluttered – way to conduct CPC (cost per click) advertising than Google IF you have a product or service that matches the environment. People are searching on Google for information. A huge variety of information. That’s not the case with Facebook. People are on Facebook to catch up with friends and family (or at least find our what they’re doing without even having to speak to them!). So the Facebook audience are less likely to look at advertising and less likely to respond to certain types of advertising. Yet there’s also less ads on facebook that you’d expect to find. Even if you voluntarily click on “see all” next to “sponsored”, there were only about 20 ads where I “fit” the profile set up by advertisers. These are things like age, gender, education level and where you live. So if it’s a less cluttered space, and if you have something that you feel will appeal, it’s a cheap marketing test. 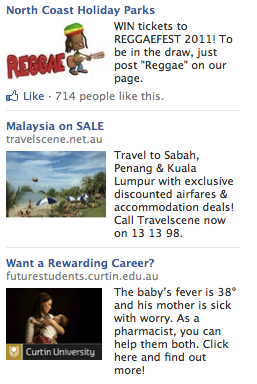 So if you do have the right product or service, the next thing to consider is what makes an effective Facebook advert. (For the sake of this article, effective just means what I think works, as I’m not privvy to the success of these ads). These three adverts I’ve grabbed at random because I think two work well, one is uninspired, but there’s something to learn from all of them. Advert 1 – The “hook” in this advert is the competition side of it. LOTS of people like to win tickets, so it’s a great way to get traffic. The cute little image stands out too. What is less apparent is what’s being advertised – North Coast Holiday Parks. I’m assuming this is a flash way of saying “caravan parks”. When you click on this, you go to their page. The lost opportunity with this great little advert is that you can “enter” without “liking” the page. The opportunity to win should have been traded for a like. And they should have brought you to a special landing page in Facebook, rather than the generic wall. This isn’t as exxy as you might imagine – you can build one for free at places like Lujure. Why do you want a Like? Then you’re actually likely to be able to market – and potentially SELL – in the future. Advert 3 – This ad has such great copy because it draws you in, telling you a story. LOVE that about it. It’s going to hit a pretty small market though – those considering University and possibly already pondering studying to be a pharmacist. As such, I’d question the marketer’s decision to include someone like me in the demographic – that is, almost 40 and already having a University degree. So big ticks for the copy, less so for the targeting, as it means you may be paying more in the CPC auction that necessary (as the wider the market, potentially the greater the CPC bidding competition). In summary – Facebook advertising can be a pretty good zero budget small business marketing tool, but just because it’s “cheap”, doesn’t mean you shouldn’t think carefully about how to use it. By that, I’m talking ROI (return on investment) – and how to ultimately get a LIKE … and then a SALE! According to a new 2011 Australia Institute survey, 46% of respondents said the order in which search results appear “always” or “sometimes” influences their purchasing decisions, and only 15% said they look past the first page of results. 42% believed that relevance was more important than paid advertising. So, that should really answer your question. It’s still very important – perhaps more than ever – to be on the first page of Google. You need to consider SEO. – Write useful and meaningful web copy, which is great for your audience but great for Google too. Make sure you includes the key words and phrases you think (or know -if you’re tracking it) people will use to find you. So if you’re a Melbourne graphic designer, make sure you use this phrase all over your website – and not just in copy, but in links, headlines, page titles, et. Google rewards relevance. – Get other sites to link to you and link to other sites. The first is more important. – Keep updating content on your site over time – don’t set and forget. Google likes freshness. This is enough to get you started. There are people out there that know a lot – and share a lot – of information about SEO. So once you’ve got your head around the basics, go out and educate yourself. This is a zero budget marketing tool you can’t afford not to be using. A tool that is so powerful and free is always going to be an essential in the zero budget marketing tool kit. I’m talking about Google Analytics. Yet Google Analytics provides you with so much information about your business that you often only take in the basics – how many visitors, how long are they spending, what page are they leaving from, what is the bounce rate (where they only visit one page and leave) and maybe how many goal conversions or what key words are bringing people to your site. It is worth digging deeper occasionally, as it may reveal some business issues that need your attention. This can be less about analysis and more about recognising a trend. Browsers – with many of the clients I help manage, I’ve been watching an interesting trend emerge over the past couple of years. By far the most popular browser was Internet Explorer…but no longer. Gradually Firefox gained traction and interestingly, Safari is also now extremely popular. Why the Safari dominance? The proliferation of iphones and ipads. Why does browser matter? If your website was built more than 3 years ago, it may not have been tested well (or at all) on a browser like Safari. So does it work as it should on Firefox, Safari or Chrome? And if not, how much of your hard won traffic is getting a sub-standard experience? Search engine optimisation is zero budget marketing gold for many businesses. It’s also something pretty basic that MOST businesses don’t get. Understanding WHAT keywords people are searching for – and thus what you should potentially NAME your business or ensure you write about in your copy – is the first step. I am by no means an SEO expert, but I’ve regularly been able to get very quick traffic & buyer growth for clients just by updating copy and headers to include the right keywords. Many website use way too little copy, so just a little can go a long way! Whilst there are paid tools and services around to work out what services you should use, Google has several of it’s OWN tools that you can use. Google Insights and Google Adwords Keyword tool are two that I’ve used regularly, but thought I’d share this helpful and comprehensive post from Link Assist which has TWELVE free Google tools you can use. So do sites like Groupon or Living Social work? If you’re a consumer business, how can you get a bunch of customers, really, really fast? Whilst Groupon isn’t operating in Australia, if you follow marketing news, you’ll have got the gist of who they are – essentially a “deal a day” from all sorts of business. In Melbourne I subscribe to the Living Social offers – and whilst I’ve yet to buy, I have forwarded on items to others and they’ve bought. Now whilst the shopper in me loves a bargain, the marketer in the me wonders … is it successful for businesses? And could it pay for itself, at least enough to pass my “zero budget marketing” litmus test (you need to make a lot more than you spend from any marketing!). So even if they sale isn’t “profitable”, the value would likely be in the database building. That said, experience also shows that “vouchers” (coupons in American lingo) see people spending MORE than the value of the voucher. So I was interested to see this post on Digital Buzz’s blog, discussing some research on those who’d advertised in the US with Groupon. 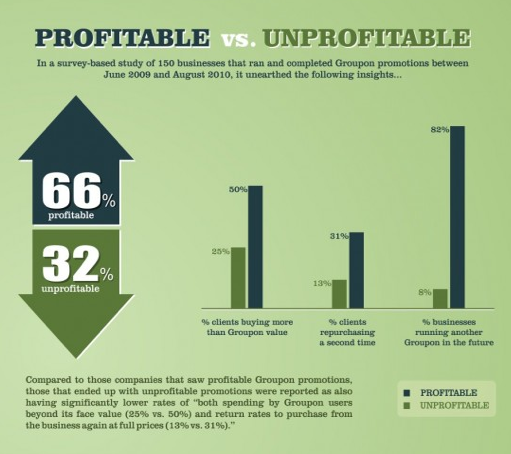 The upshot seems to be that it IS more profitable than unprofitable…and that around 50% of buyers spent more than the coupon value in the case of the profitable ones. The post highlights a specific example for American Apparel, where a $25 coupon worth $50 generated an average spend on $70. Now, the missing piece of the puzzle is what it COSTS to get your offer onto a service like Groupon or Living Social. If anyone knows, do share! PR is one of the greatest weapons of the zero budget marketer. But not the sort of PR that most people THINK is PR – putting out a media release to any and all comers. Well targeted PR is what’s key. Being in/on the right medium for your product or service. This means that with your limited time you can focus on researching the right medium and ensuring the pitch is interesting to someone else (there’s a whole other blog post on what NEWS actually is!). I just saw a great example of selecting the right medium – and thanks to The Start Up Daily for sharing the details of their success with Springwise. I love Springwise; a fantastic site & newsletter that shares news of very creative, entrepreneurial startups. I always finish reading it and feel inspired…and with a few ideas in my back pocket. Yesterday they featured a business idea that I thought was very clever – a daily blog featuring a vignette of wisdom from a business book each day. The revenue model will be kick backs on book sales. Obviously a volume game, but I think it has potential. So I signed up. Here’s the kicker. Apparently, so did 41% of the visitors from Springwise! 41% is a DREAM conversion rate. It’s MASSIVE. The Start Up Daily had obviously found the RIGHT place to attempt to get coverage. The author, Karl’s, post said he was shooting for 1000 subscribers by 1 Feb. When I visited yesterday he was at 2,500. And today he’s at 3,300! What a success. Now, as long as Karl keeps on putting out great updates, and he keeps reminding people to do so, they’ll share. And he’ll keep growing. So the zero budget marketing tip today is that PR is your best friend if you (a) have a great story to tell and (b) find the right place to target the story. And the right place isn’t necessarily a daily newspaper…in fact, in today’s online world, the right blog post can apparently blow your aspirations out of the water. Step 4. Once you’ve found your design & installed into onto your host, you now need to think CONTENT. This SHOULD be the easiest part of the process – but is often the hardest. (I’m a marketer and I am much better at writing engaging copy for my client’s businesses than I am for my own!) You need to break it down into areas of interest that are relevant to your prospects – whilst still showcasing what you can do. Different themes may also have different places to include copy so that it appears in the right way in your layout. You’ll need to take the time to learn this first. Most themes do come with instructions – plus a little bit of trial and error goes a long way. TIP:You also need to remember to make your copy Google friendly. This is a whole other post (actually, hundreds of posts!) but some of the basics include considering what keywords you think people might search for your kind of business on – and then includes these through out your site, as often as possible and in everything from body copy to headers to links. Step 5. Think about what else you can include on your site. So not just pictures and words, but perhaps one of the thousands of wordpress plug-ins that can be installed to increase the functionality of your site. This could be anything from a twitter feed to an email subscription box to polls to….anything that will add value (or traffic) to your site! TIP: Some plug-ins don’t “agree with” certain themes, so not all plug-ins will work with all wordpress sites.